Yes, I love light-colored floors! And I often receive questions about our bleached floors. So let me share what I know. Let's get started! 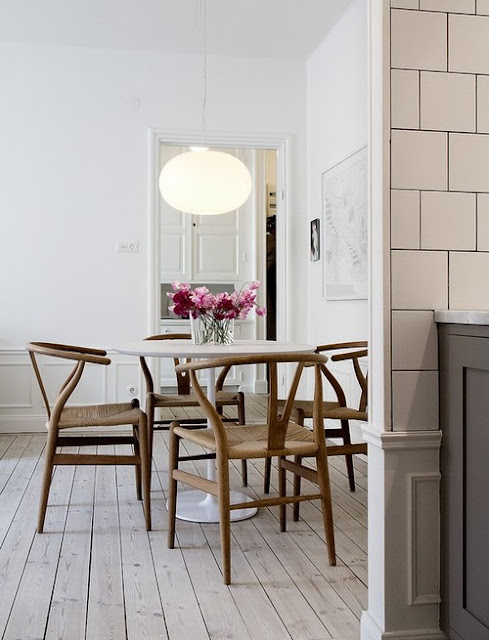 Whitewashed floors have been around for hundreds of years in Sweden and Scandinavia. 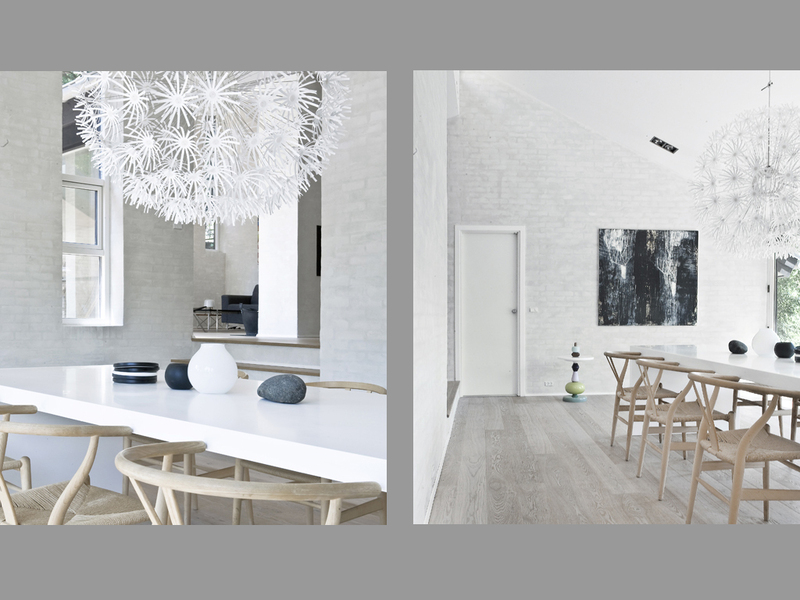 Because the Nordic winters are so long and dark, having light-colored floors help to keep interiors bright. They are also quite versatile, and can work with traditional or modern furnishings. 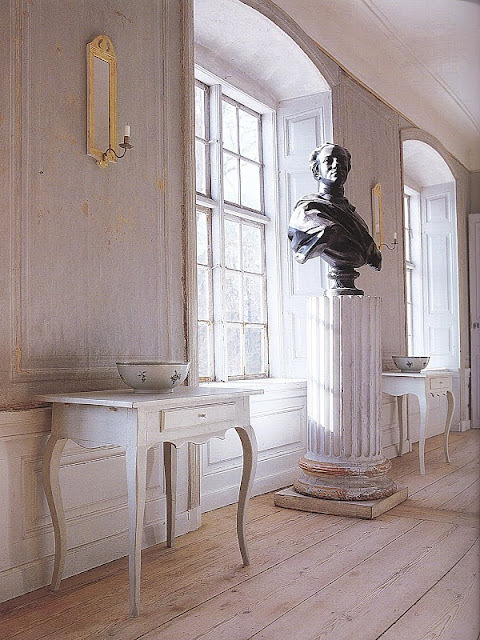 Throughout Ekensberg Manor outside Stockholm, Sweden, many of the pine floors were whitewashed (above and below photos, both by Simon Upton for House Beautiful). Built in 1790, Ekensberg is being restored by Lars and Ursula Sjoberg, both respected scholars on Swedish antiques and the decorative arts. The pine floors above and below seem to have a lyed soap appearance. Both photos scanned from the book: Rum for Mobler by Lars and Ursula Sjoberg, photography by Staffan Johansson. Scandinavia is covered in spruce and pine forests, and much of the flooring comes from these blonde-toned woods. Staining these woods can be problematic as the sap from the knots tend to create blotches. Instead, the floors are often given a clear wax finish or whitewashed treatment involving a lye soap mixed with chalk / lime pigments, calcium carbonate, etc. The combination of the lye (sodium hydroxide) prevented the wood from yellowing while the chalk / lime pigments left a whitewashed appearance. I do not know the exact formula.....anyone? I do know it requires upkeep and refreshing often. In the above kitchen, the knotty pine floors have a milky finish. In the dining room below, the hardwood boards (most likely oak) have been bleached, whitewashed, and oiled for protection. We had pine floors in parts of our former home, and it didn't bleach well - a bit streaky and peachy. Therefore, I suspect the pine floors above have been lyed due to its consistent appearance. Notice how lovely the light-colored floors look in modern settings. Quite different from the 18th century manor homes above, but equally beautiful and appropriate. From the airiness to the furnishings, I love everything about this modern home by NORM Architects in Copenhagen, Denmark. All photos from NORM. And for comparison, below is a drawing room with painted floors designed by Albert Hadley. See how the monochromatic painted finish is different from bleached and lyed surfaces? When we renovated our home, Tom and I installed new 7" wide white oak boards in random lengths. As with the floors in our former home and many of my projects, I entrusted the finishing work to Classic Floors. 1) Order extra stock as there will be unattractive boards which should be rejected. 2) Try placing darker boards in the centers of the rooms which will be covered by area rugs. 3) Try bleaching darker boards twice, but be sure to do a test as over-bleaching can turn the wood green. 4) In lieu of an oil treatment, bleached floors can be sealed with a water-based urethane in satin finish. 5) Stay away from red oak which tends to bleach pink! 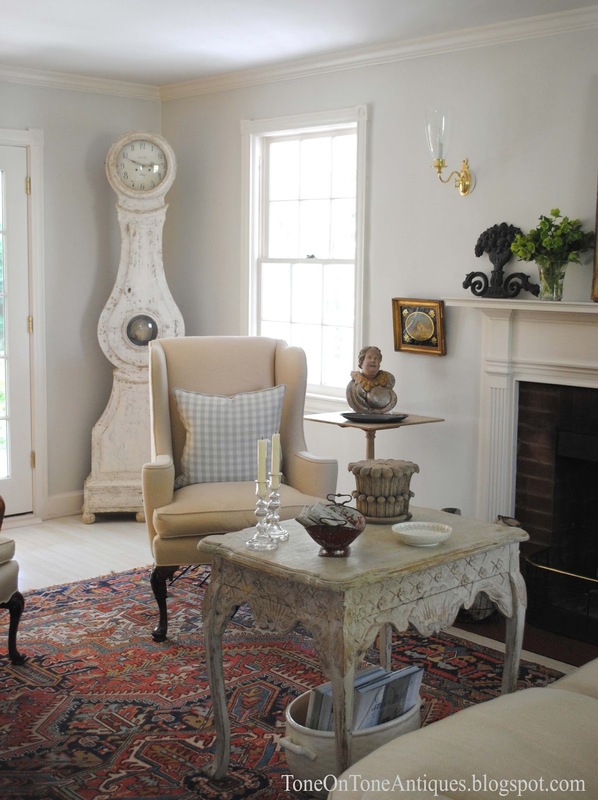 In our family room, the floors are complemented by a neutral Oushak. The painted sideboard and trestle table are both Swedish from the 1800s. To keep the room from being too pale, I included a few iron pieces with blackened finishes. 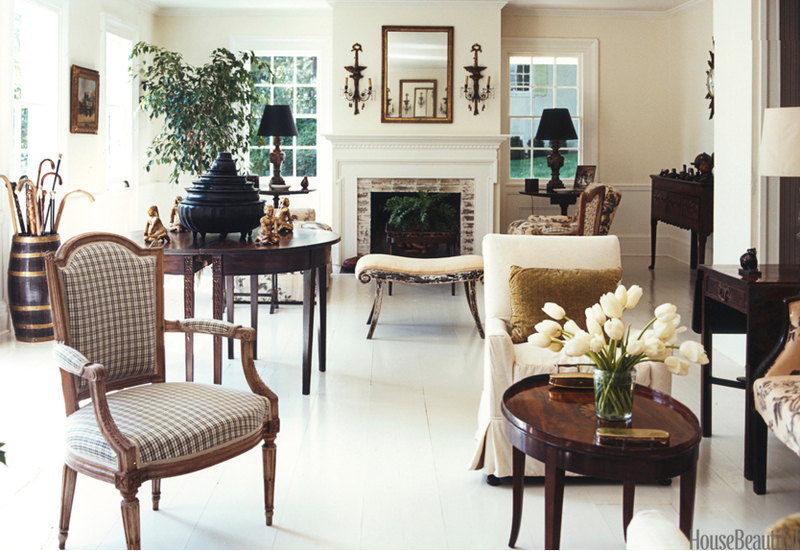 Darkwood furniture looks even more stunning on light-colored floors. The chestnut sideboard is French, and the oak child's posture-correction chair is English Victorian. At our shop, we have a small room with bleached floors. Sometimes, I like to leave it bare, and currently, there is an antique Oriental rug that is beautifully worn. Do you remember Michelle and CD's home which I decorated? 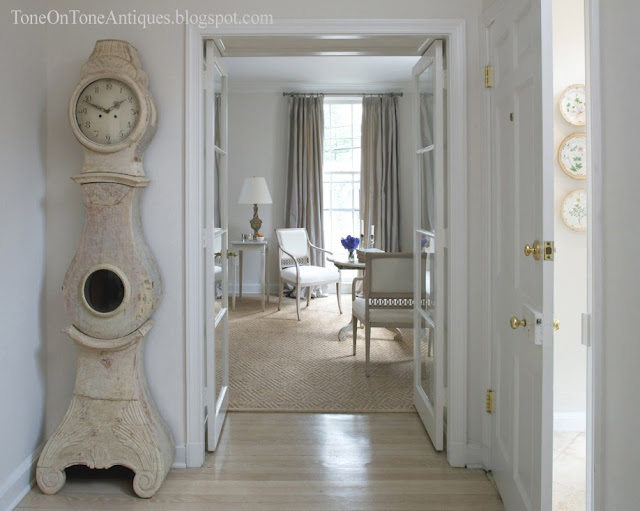 Look how beautiful their bleached floors are with an antique Oriental. In Linda and Kit's former home, I had the bleached floors sealed with a water-based urethane. 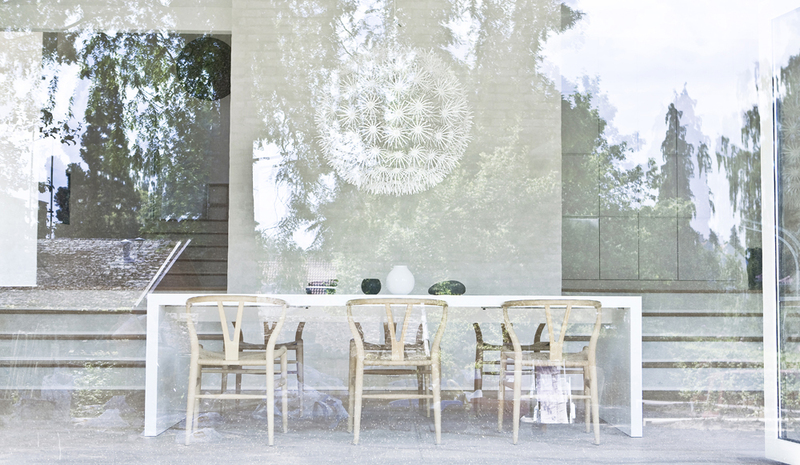 I love the serenity of this home which is decorated with Swedish antiques from Tone on Tone. 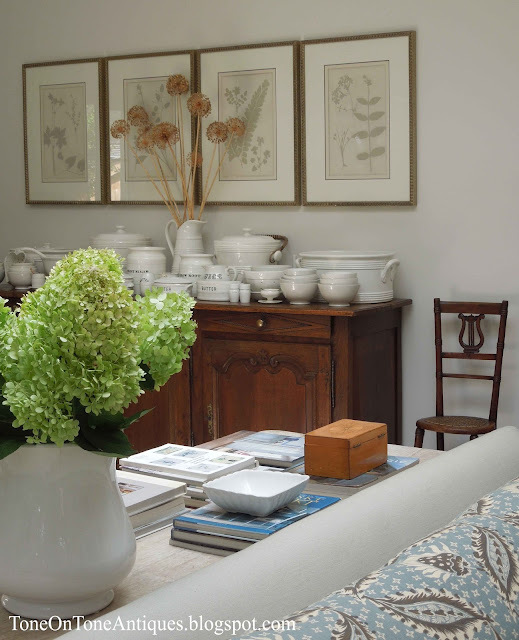 A big thank you to photographer Lydia Cutter for sharing these photos from Home and Design Magazine. Lydia was such a pleasure to work with, and her portfolio is amazing - check it out here! I hope you have enjoyed this post. If you have information on light floors, please feel free to share! Thanks!! PS - Bleached floors are quite easy to maintain, and require very little dusting! I am astounded at the beauty of these floors and the tranquil peacefulness they create in a home- how I would love to have these in my own house! I am afraid they sound rather difficult to acquire and maintain- but, I can dream! 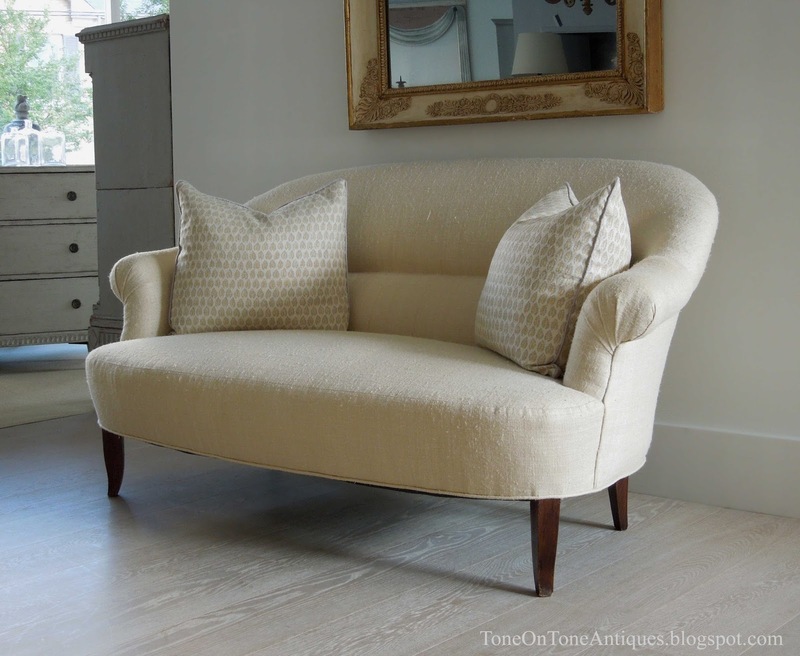 The photos you have chosen to illustrate this post are exquisite as well as those of your own home and client's- I will reread this post many times!! Dear Loi, I love this look! It is what I wanted in the house here, but the floor finishers hired by our initial contractor didn't have experience with it and we were in a hurry. Rick thinks we need to redo the kitchen floor - the house's highest traffic area (in addition to being the two dogs' favorite spot) is looking worn - so I am going to try again. Do you know anything about Briwax? I saw photos of floors treated with it online. Phyllis - We have used Briwax on unpainted wood furniture, but not on floors. It is a very good product - a nice sheen but not shiny. Good luck! I had a loft apartment in a building owned by a friend many years ago and we sanded and bleached the floors. We thought were crazy because the only wood bleach we could find was in little bottles. The floors were white oak and we bleached them twice before putting on a coat of white stain (I think the Minwax white stain had just come out) before the water-based urethane. They were beautiful. The variation in the bleached floors is much more forgiving (to dust and pet hair) than painted floors. I particularly love the texture of the floors in your shop. I've been trying to decide what to do with the floors in kitchen so I'll be eager to see if your readers have any suggestions. Thanks for sharing your experience with bleached floors, Steve. I hope your kitchen renovation is going well. All of these rooms are so lovely. I especially like the natural aging of the unpainted floors. The subtle tones appear warm even in northern light. 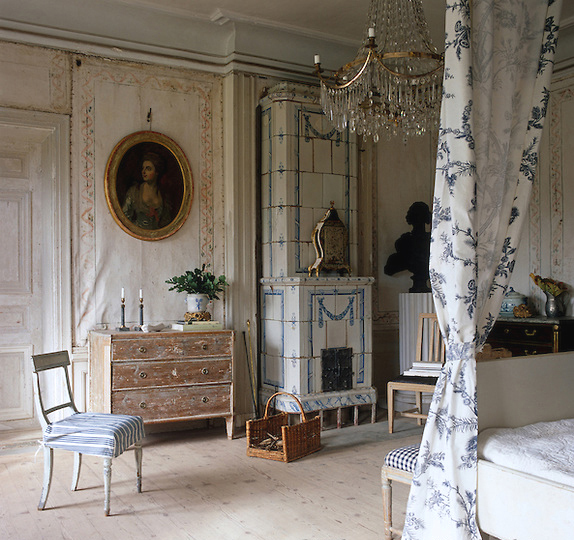 Thank you for the background research - I have often wondered why Swedish interiors have such light colors, when the snow outside is also light& bright. I never thought about the local wood and how it might react! I truly enjoyed this post, Loi. I really love these bleached light floors. They add so much sophistication to the room. I also love your chestnut sideboard! I love the light floors. I also love the child's posture correcting chair. Never have seen or heard of one of those before. Great post. I love this look SO much and I love how it can lend to vintage modern or more european antique style.... just gorgeous! This post is fascinating and beautiful at the same time...I didn't know the reason the floors are light in Scandinavia ...your home is warm and inviting! Beautiful! I loved your white floors! I think that is so classic and will stand a longer test of time than the ever popular dark stained floors today. Thanks for sharing the process and all the lovely photos! Have a great week. Talk soon. A very interesting post on floors. I love the elegant feel your floor with the oushak. I love painted floors and have had many in my previous farm house. 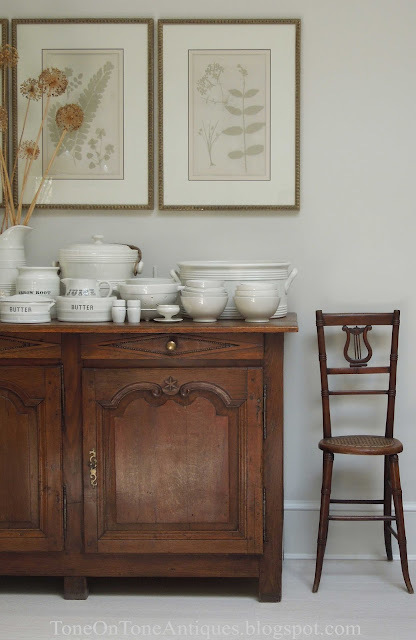 I favour the Farrow & Ball floor paint. Loi your home and yes the floors are so very special. You really have the instinct for what works well together. A superb eye to pick only the best! Thank you so much for sharing! The light colored floors are so beautiful, soft and neutral. Oh Loi, so complicated but so effective. I did paint the floor in one of our guest rooms white. It was a maritime theme and I loved it, but I do see what you mean with lightening and revealing the grain rather than flat opaque. Very informative. Thank you Loi. Superb! Good morning my friend! I am honored to be commenting here right after dearest DI! HI DI! You did it again, Loi. You and Tom.....you are genius! I am going to show my husband your tips on the flooring; our upstairs loft bedroom/library is just precious. It has the white beams, dormers and such charm. The wooden planks of the floor are perfect for a treatment of bleached white, but this will be a project for next year, but your tips are VERY HELPFUL! I am in love with Swedish interiors, and here in Minnesota where Scandinavian heritage rules (I LOVE IT), the sensibilities show through in the art and design of homes. In a land like their mother country, the Scandinavian style is light and bright and HAPPY - to get through those long cold months! BRILLIANT. You did it again - you swept me off my feet and I love every room of your home, the photos you shared. I adore light floors but would worry about having them in my own home with dogs and children. My mom has them in her beach house though and they seem to have help up well for the past 20 years so i guess they are more durable than I am giving them credit for being. Great post! I learned something! The two pictures of Ekensberg Manor are inspiring. Thanks! Hi Loi, those floors are beautiful! We are having herringbone pattern, solid white oak wood floors installed in our living/dining area, plus the stairs on hall on the second floor, sometime in the spring next year. We had the carpet pulled and the cement is white with a lot of patina and aging. That look has made me decide that the floors should be light and bleached, because everything is looking great on the white floor. Thank you for this very inspiring post! Just stunning! I have red oak floors without a stain. They are light in color, but not as light as yours. When I had them installed there was so much pressure from my friends to stain them dark. I just didn't want that look. It is so nice to read about your light floors. I hope they are coming back strong because they are also so much friendlier to pet hair and minor scratches. Love the ethereal, light look of bleached floors. Of course, yours are gorgeous. Would love to have them someday in a beach cottage. Oh, and the Victorian posture correction chair - looks great but now that I know what it is, yikes...! Just so lovely :-) Love the look. I think I am going with light, if not bleached, wood when I redo my floors. It has such a clean and airy feeling. Loi, this post has been informative and beautiful....I love the light feel of them and those rugs are gorgeous! Absolutely stunning, Loi. I am bookmarking this page because someday I would love to have a home with light floors - I think that they would be the perfect way to bring a little light into the long, dark Pacific Northwest winters. All the spaces you've created look so beautiful, I would love to have a little bit of your magic in my own home! Happy Monday. You are so right about light floors. They highlight each piece of furniture and every fabric in the room. We did a whole house remodel/addition on our second home, a Cape. 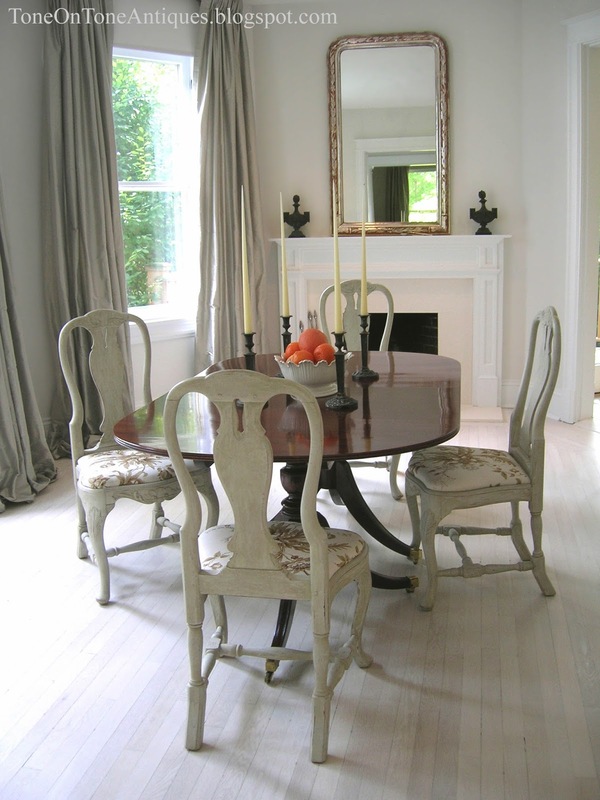 We chose to whitewash the oak floors to make patched areas appear seamless. They added so much style and beauty to the house! What a difference and they never really showed dirt, sounds silly but it is absolutely true, having blond haired dogs helped in this though. I found them to be very hard wearing and easy to care for. Great post as always, nothing prettier than a Loi post! Thanks for sharing your personal experience with light-colored floors, Cindy! As you know we have 2 medium-sized dogs, and our bleached floors are just fine. Just the same amount of cleaning / washing as dark floors. But definitely less dusting! Oh so lovely and something I would love to have...but, alas, never will! Would you believe this house has all laminate floors? Not my favorite by a long shot. And, to make matters worse, the entire downstairs is a parquet. We looked into redoing but the price was just too high at that point..but yes, we are rethinking this! However, it will never be real wood floors, much to my dismay! Beautiflly quiet and serene, the floors are perfection! I've often thought of having my wood floors bleached. The walls in my house are glazed a darker tone, & I've thought that lighter wood floors would be a nice contrast possibly. Thanks for the great photos to think on. BUT, I must tell myself, one project at a time-- the patio is ALMOST finished. I can't wait to see what you think. I've missed chatting with you, I've been so busy this summer. I hope you've had a great one & that you're enjoying the last warm days. I keep remembering your white pumpkins from last fall, & thinking-- I just might have to try some. What a great tutorial on flooring. I love the way your floors look in your home. They are so beautiful. I adore them! Great post. loi, wonderfully beautiful post, as always. now you have me wanting bleached floors in my home. In your first photo, I am reminded how beautifully you pair traditional mahogany pieces (dining table) with lighter swedish ones (chairs). you are a master. a post on that sort of pairing someday....??? Thanks for that suggestion, Donna!! I definitely will write a future post on that topic. when my inbox displays a new post from you i settle down knowing i am in for a treat, you never disappoint. always intrigued by the history of the decorative arts, particularly of europe, this was a fascinating read. please continue to share images of your home and shop loi, oh and your garden, i never tire of your inspiration and exquisite eye. Beautiful, beautiful, beautiful. Am going to trot downstairs, make a second cup of coffee, and come right back and pour over these beautiful images again!!! Hello Loi, Those light floors add a lot to the look you achieve, complementing the furnishings and making the rooms bright and airy. My floors are a white-and-green marble checkerboard, which has some of the effect of your light floors. The smallish 5" squares keep the pattern from becoming dizzying, although I sometimes place rugs or mats to lessen the effect of too much stone. Thank you for the tips, Loi! All of these rooms are gorgeous! I liked the bleached wood too. Thanks to you I have a new appreciation for light/ bleached floors. I love the water based urethane finish you presented but I could see something much more rustic in a cottage setting. All pics were amazing and refreshing. Thought about Tone on Tone when I connected through Dullus twice in the last few weeks and I am sure that helped destress the situation of flights that were held up for 5 hours. I just tried to picture your blog pics and revisit in my mind's eye. I am thinking on taking an antiques course...any suggestion? Maggie - The next time you are in the area, please let me know. We'll have coffee at my place?? Regarding a course on antiques, I would check with your local college / university. Good luck! Loi, as all your other posts, this is so informative!!! I am so glad to read postings from bloggers who really know what their talking about and give all the details they can to their readers. Because as a reader, it makes me feel intelligent too! Hahaha! Your home is absolutely divine and heavenly and light floors truly give the ethereal feel and warmth thru the home. You know I'm one who love floors on the 'dark-side' (makes me feel like Darth Vader here ;-0), but I also adore these flooring. Maybe when my two boys are off on their own?! great post and thank you! I have been a fan of light floors for years, and loved getting the history and the tutorial on the look. In my last house, my floors were very light - I think they were a combo of paint and poly. I didn't build the house, but I put wood floors in the hall upstairs, and this is how they achieved the look. In my current house, the floors are a bit more natural oak color. We used an Italian product that is not oil, but not poly either. It has a lovely satin finish. Although, like Phyllis, I think we might need to re-do the kitchen next year as it gets so much wear and tear. Gorgeous as always! OK, its a long way from light wood floors, but my new house here has large creamy white tiles on the floor and I am loving the luminescent quality it is bringing to the interior, especially compared to the dark wood I had in Tokyo. I love white floors! I think the whitewashed look is warmer than the painted and I also think it would be easier to keep them looking clean. Someday I want some form of white floors in my home! Hello Loi - the soft colour of the wooden flooring is the perfect foil for showing up furniture and complimenting textiles. I also love flooring made of old flagstones, again using a soft grey which has a similar effect. This was interesting...I love the look although I don't think I could actually pull the trigger on doing it in my home. The rooms you designed are spectacular, I'm beginning to recognize your work, it's always so wonderful. Thanks for this post. Loi, what I always love about your posts are their specificity. I have wondered how to get bleached floors, have asked at paint stores, and have not gotten any answers. So, thank you. I hope to get to Bethesda some day soon. I will stop by and say hello. If you get to Pennsylvania, please come see us. Love that you shared this today, Loi. I've always wondered what my floors would look like all bleached and whitewashed since they need refinishing anyway. Might be a disaster with all the dirt we track in from the barn and pasture, but they sure are gorgeous! I had no idea the reason floors were bleached in Scandinavian countries was to bring in light on long winters. 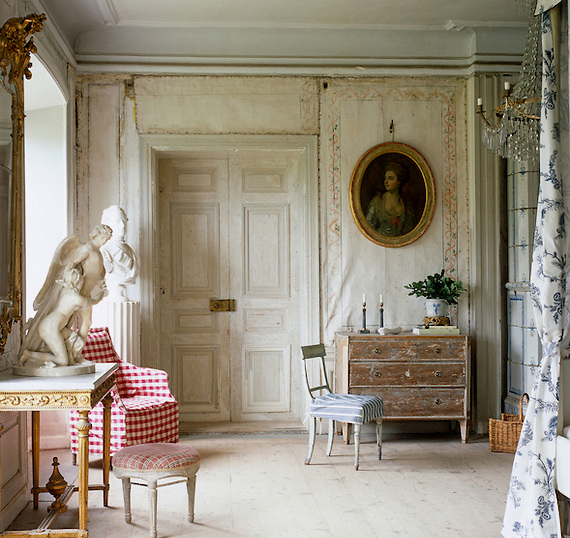 Absolutely beautiful rooms and furniture especially the manor house! I am going right now to look for the books you mentioned. I cannot wait to learn more about the floors and this style of furniture. Have a great week Loi! P.S. Life is too short and to precious not to have dessert first! The floors are so pretty! 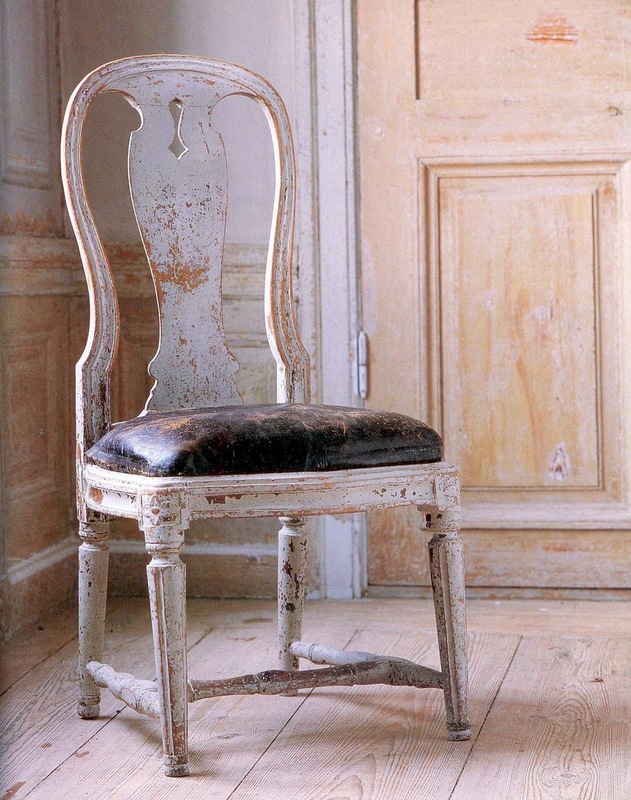 I love the look of both the bleached and the lye washed floors. I wish I could do something like this in my home, but the budget will not allow. I have considered painting my floors, but I fear chipping them too much, as I move things around quite a bit, and am pretty rough on them. Seeing your lovely photos makes me want to experiment, though! Hi Loi, what a gorgeous post. All stunning! There is a specialist in the UK who is very knowledgeable about such floors and treatments and does I believe sell lye trip trap wax etc via her website. She is Eva Johnson - look her up! Greetings, Sheena ~ Thanks for sharing that source with all of us....really appreciate it! Hope you had a wonderful summer!! Hi Loi - I always love to see photos of your home! 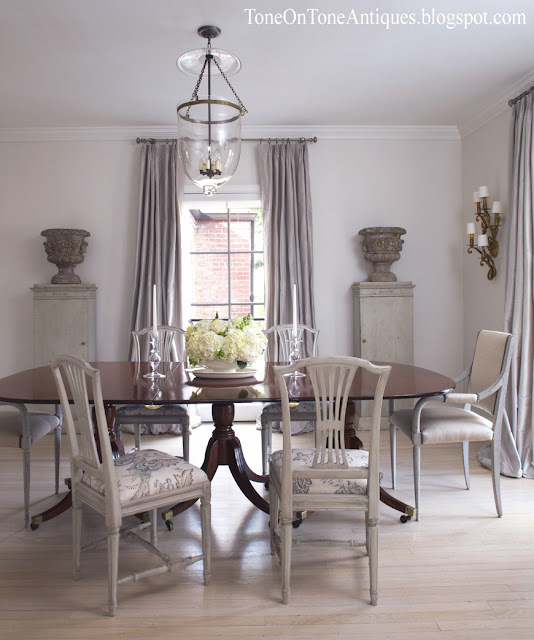 I also adore the homes that you did for Linda & Kit Bonds and the photo of their former dining room is one of my favs too. Question: How do you care for your floors? Vacuuming and an occasional wash or just dry mop and spot clean? I always hear one should never use water on wood floors. Sorry if this is a mundane question.....who wants to talk about house cleaning on your beautiful blog. Good questions! For dusting, I use Swiffer dust cloths. For washing, I use warm water mixed with a Danish soap with white pigments from WOCA. Leaves a beautiful sheen...almost flat. Thanks, Deborah. In the early 1980s in my first home, I bleached and white-washed my oak floors. It was a lovely look with a mix of modern and antique furniture, but I think it would have benefited from a polyurethane or wax coating for easier maintenance. Thanks for sharing these lovely images. amei esses piso de madeira. Estamos construindo e vamos usar madeira de florestamento para o piso, amei as dica vou escurecer, moro no campo e tem muita sujeira, todos entram dentro de casa com os pés sujo, fica impossível manter limpo. Sua sala é linda. Me inspirei em suas lindas decorações. All very beautiful these light floors! Love yours! 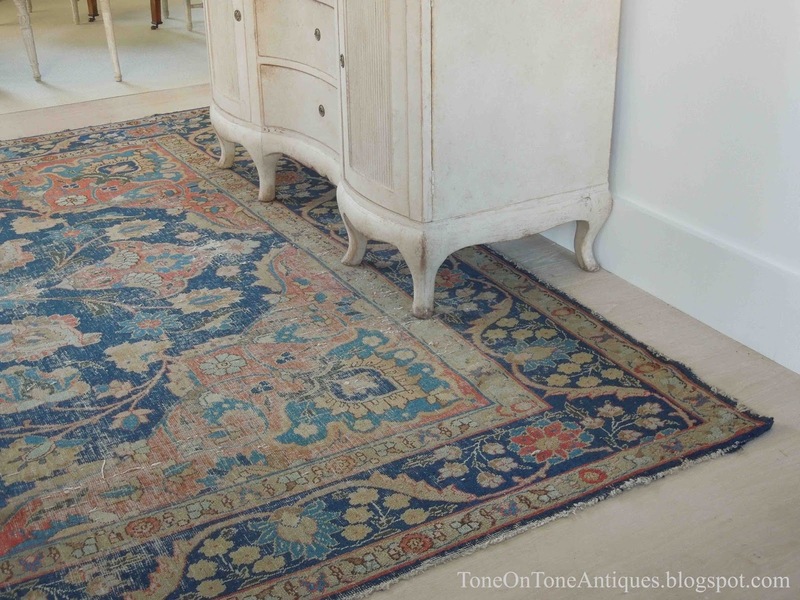 And I so agree with you that a an oriental well-worn carpet looks just gorgeous on the light stained floor! You helped me a lot with this post Loi! I was thinking about what carpet I should suggest to put on the light stained oak floor in a client's home! So thank you, I think I found it!! Such a soothing look all the way through...love this palette so much Loi! Dearest Loi, these are all so beautiful! I love the lightness and freshness of the floors...and I am especially in love with your Oushak rug!! This post was lovely and so timely. We are laying our hardwood floors now and I'm testing pieces and trying to get my stain as light as possible. Wish me luck:). I'm so glad you shared photos of your friends home again (Michelle and CD), I love what you did there, loved it all. I need to revisit that post again. Very inspiring as I'm shopping for furniture now....so many ideas!! Good luck, Sarah! Can't wait to see your floors (and more!). Hope your renovation is going well. Oh my friend, thank you for coming to visit me; I am running around now to teacher meetings in this humid heat of ours! We seemed to have escaped summer temps until now! And the classrooms I've been in are terribly warm. But to see your visit always makes me happy, and I spoke fondly of your yesterday to a designer friend of mine here in The Twin Cities. 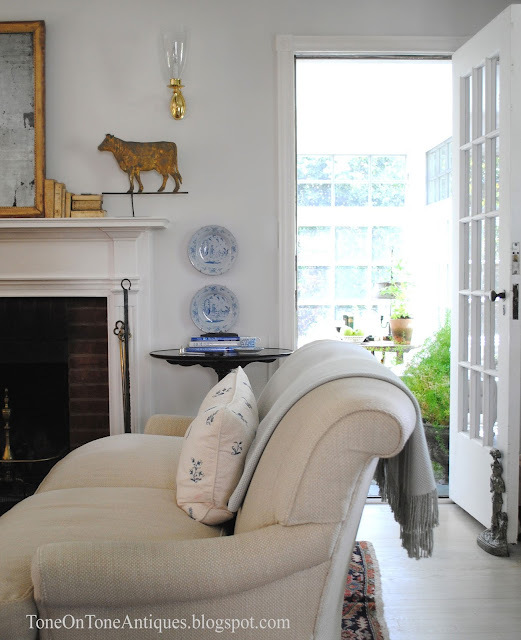 We talked Scandinavian antiques and I said, "I KNOW THE RIGHT PERSON WITH THE RIGHT TOUCH!" Hey Mr, absolutely beautiful post. 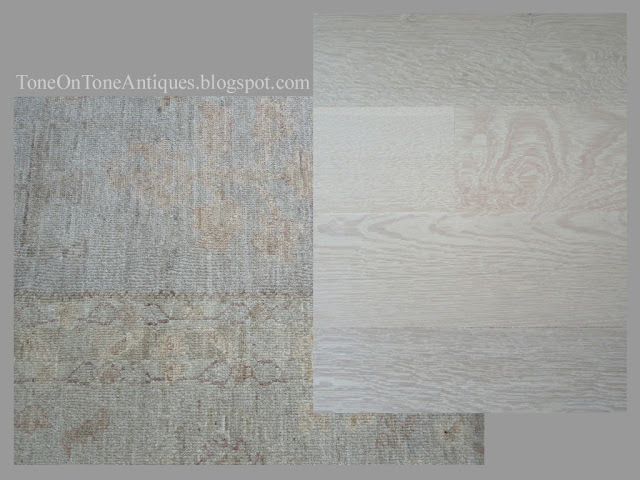 I would love to have bleached blond wood floors here one day, they have such a calming effect and would work so well with the platinum grey turkish carpets we have. The oriental rug you have in the shop reminds me very much of a batch I was given by one of our clients recently, one of which now resides in the kitchen. I am in awe of the asymmetric photograph of the chestnut sideboard and posture correction chair and the last image of your dining room with those beautiful foaming hydrangea, both real beauties. I would be interested to know what the pedestal pieces are that are supporting the stone urns in the last image as they both have functional handles. Thanks, Paul! Those pedestals are actually cupboards with very shallow-depth. Inside, each one has a top drawer and multiple shelves below. Bleached floors are so beautiful. I would love the added lightness they'd provide! Absolutely lovely images, Loi! Hi, Loi, This is a fascinating post, and you've certainly sold me on the virtues of bleached and lye'd floors. I like the Albert Hadley room, but see how it could have been a little warmer with the natural floor. He did make the room work better by using the whitened bricks around the fireplace, though. Loi- so informative. I have to admit I love light floors and if I could do it over again I would choose a lighter stain. dark floors are so hard to keep up with up. And as I've told you before your home is exquisite! I love them, I I see they stand up to your four legged members of the family too! I had a client who wanted them desperately but she had red oak so I had to burst her bubble and force her to get a darker tone to avoid pink hue. Wonderful post as usual!! Oh Loi... I first saw this a few days ago... and it took my breath away and still does. Its all so incredibly beautiful, it almost hurts. My next home, (after my rich prince comes to swoop me away! lol) I am doing this. (although, I have to say that I am also enjoying my beautifully warm LR with pale Swedish-type accents!) I did do a light floor one time in a contemporary home. We didn't bleach the floors, but we sanded and then put down two coats of an off-white stain with a slight greenish-cast, to counter-act the yucko pink tone, you would get otherwise. Then, we polyed with 3 coats, I think. It turned out wonderfully and has also held up very well. I so love this look! Hi dear Loi, sorry I am late to the party. I always always read your posts as soon as they pop up (usually at work!) but I never get around to commenting until a few days later. You always give me so much to think about. Serene is definitely the right word to describe these perfect floors. I truly love this look, and I expect that the light floors also hide a multitude of sins (dog hair?!). My cat, though orange, shed a sort of white/peach coloured hair and it would have totally disappeared on these floors. haha. I would not need to vacuum as much. Light floors look very elegant but a fanatic like me will always be running around with a broom and a mop cleaning every spec, which will make my life further miserable :) These light floors look stunning in your home, Loi you live in a very enchanting environment. So neat that you posted about pine floors today. We have pine floors throughout, and, being influenced by you, I was thinking of lightening the kitchen ones somehow. Much of the dark stain has worn off, and I was wondering if applying a thinned gray-white paint then rubbed off would give me the effect I seek. Probably not, just an idea to avoid the whole stripping mess. Any way, I found your post today apropos to my project and informative as always. Will let you know if we take the plunge. Love the idea of little dusting. Love the look Loi! The contrast with the dark furniture is wonderful and that part about requiring little dusting....uh, BONUS! Beautiful pics! All beautiful, all bleached to preference and all very tempting! In my Mediterranean climate, almost all floor surfaces are decked out in tile, whether it be porcelain, ceramic or stone, to combat the heat, with the sometime exception of bedrooms, in which case, wood is the surface of choice as it sustains heat. I think the Scandinavian system is right on target: wood for tactile as well as aesthetic warmth, done in light colours to boost lack of natural sunlight. Thanks for all the stunning photos and interesting tidbits! I don't know how I was late to this spectacular post only to say I've been recovering from our "girls weekend" and engrossed in work. I adore your floors and so happy to learn of the background, care and how they were necessary to lighten interiors in the dark winters in Swededn....brilliant! Love your showcasing your home more. Have a great weekend my friend! Such an informative post as always! I either like floors really dark or really light, not so much in between! Loved hearing the history! You had me a white floors.....I am still loving mine and after 3 years they have held up beautifully! I can't imagine ever having stained floors again....of course yours are beautiful! I was looking for pics and directions of how to do what I was thinking is a whitewash finish in my bedroom and came over your blog. I'm so excited. I have no idea of what kind of wood the floors in my room are but they are the regular skinny planks and not the beautiful wide ones. Someone once said that houses in my area had a lot of red oak flooring but they didn't come to see mine. I can't afford to change due to the amount of work my entire house needs. I still have some reading to do on if I'll use the regular bleach like another poster said they did a long time ago. But, I really hate the poly finish due to the expense and the fact that it just doesn't last in my house except for rooms that nobody uses. I'm wondering with your experience and knowledge what your thoughts are on me bleaching, staining white, glazing and then just using a great oil like they did back in the old days. Do you think this would keep up the beautiful look and be a long lasting solution for forever beauty? The floors have needed sanding and refinishing forever but it's expensive. I just bought some old Italian made Bombay light colored night tables and am looking for a cream fabric headboard that has really inspired this change so I'm so ready to go. I can't wait to hear your thoughts and direction. 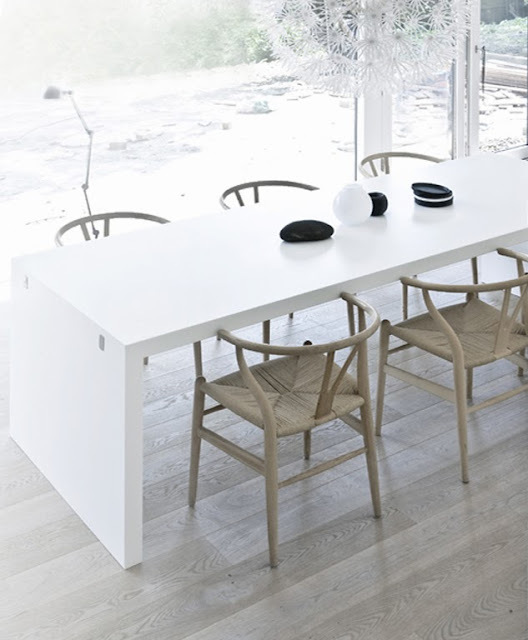 St Barts are one of the most trusted organizations in this sphere, engaged in manufacturing, supplying and exporting Contemporary Whitewash Furniture . wow! 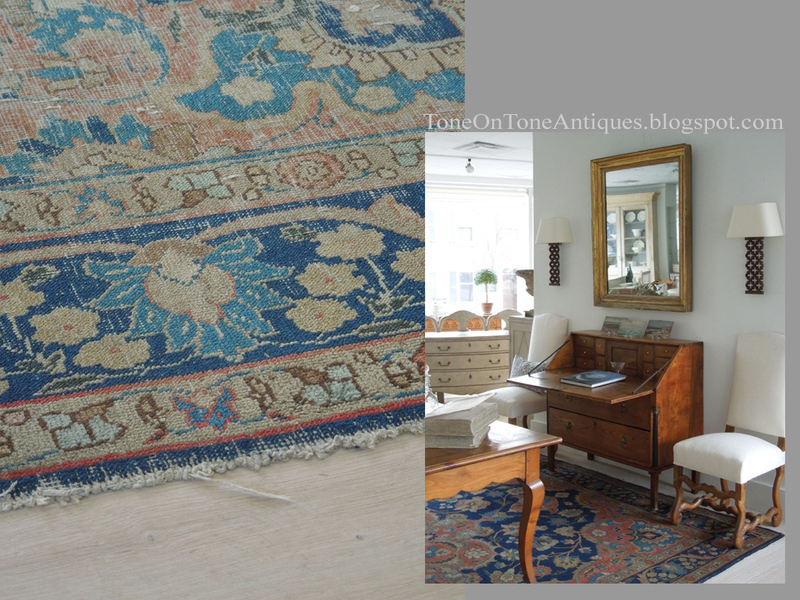 Your shop is beautiful and it is so warming to see the texture and color of the worn rug. After reading your blog post i come to my point of view that your blog post idea is look very fresh and unique. Do you have a suggested brand/color of light laminate flooring. LOVE your blog. Thank you!!! Cherish that you imparted this today. I've generally pondered what my floors would resemble all blanched and whitewashed since they need revamping at any rate. May be a debacle with all the soil we track in from the stable and pasture, however they beyond any doubt are flawless! Beautiful home!! Flooring texture is awesome. Am humble for this post. Thanks for sharing us. For lighting for lighting for floor@ affordable costs visit Foslighting, where available your all lighting needs solution. Nice post with great tips. Hope that we will found more helpful post like above from you soon. Thanks. Nice blog and nice service this kind of services make attractive our Homes. Find wide selection of carpet cow, laminate and hardwood flooring services in new York. Find wide selection of carpet cow, laminate and hardwood flooring services in new York.We are dedicated to providing first quality merchandise and service to our Customers. I definitely enjoying every little bit of it I have you bookmarked to check out new stuff you post nice post, thanks for sharing. That looks nice! I wish I had the time to renovate my old wooden floors... But I might actually ask someone to do it for me, like the home expert - I heard they're really good with flooring! Nice post Thank you for sharing it. More Carpetnwood Is a well established business with over fifteen years of experience in the carpet and flooring industry. SanGo86 interior decoration workshop is specialized in designing construction as well as installing wood furniture in Hanoi and neighboring provinces. With many years experience in the profession, along with the modern construction system. The company has been one of the partners of many large projects in Hanoi. That is my first time i visit here. I found so many entertaining stuff in your blog, especially its discussion. From the tons of comments on your articles, I suppose I am not the only person having all of the leisure here! i want to say thank you for this informative blog. Today I am visit your profile and I read your blog then I realised this blog is very interesting and helpful. For Home Renovation company TorontoAsasa Constructions is the best home addition and renovation contractors for home improvemrnt,kitchen renovation,bathroom remodel,new home addition,basement design and finish,windows and doors in low price. The Best and cheap price Kitchen Renovation Contractors in Toronto GTA, Asasa Kitchens caters from New Kitchen Intallation, Custom Design Kitchens, Kitchen Remodel and Refacing.ASASA kitchen products are kitchen cabnit,kitchen tiles,kitchen hood installation. Nice ressources, thank you very much for sharing.